Lately I’ve been seeing a lot of activity on LinkedIn, which is very good, and some people were asking me about how to improve their presence on this platform and according Business Insider, this network just announced a major landmark: 300 million members around the world now use the service . And I thought : Sarah Santacroce has the answers! !, because, she is a LinkedIn Specialist. 1. In your opinion, what are the three main characteristics that a professional should have on their LinkedIn profile ? A professional profile picture, because, visual branding is important. 2. Should LinkedIn users ask for recommendations and endorsements on their network ? They should ask for recommendations and send a personalized request. 3. Could you suggest some tips to users on the improvement of their presence on this platform ? Make your profile visible ( is a must ). 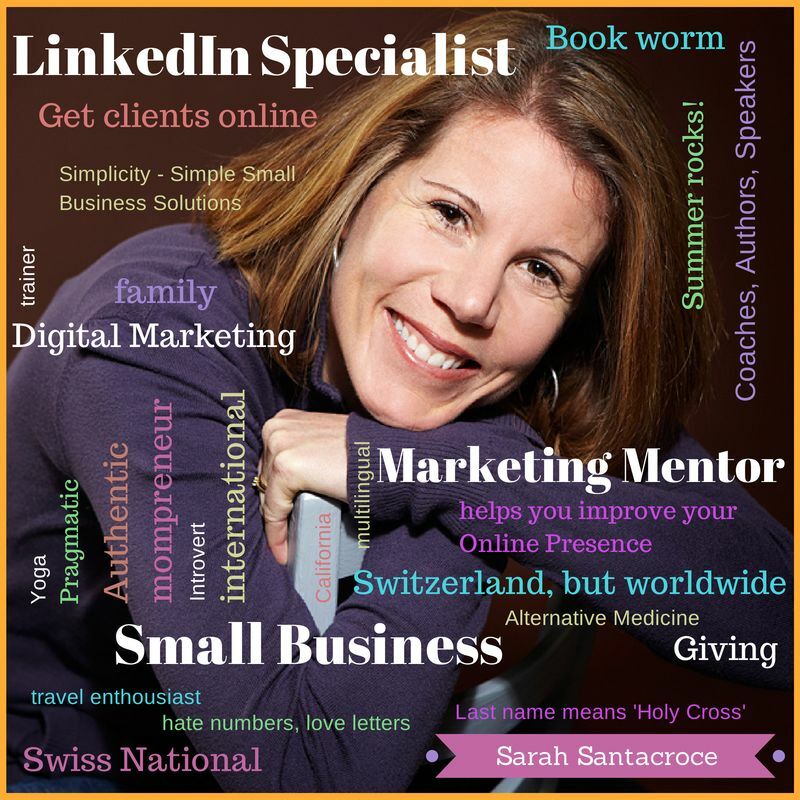 I want to thank Sarah Santacroce from Switzerland, for this interview and I am sure these great answers will be very helpful . Today is a very special day, because, I have a guest on my blog in English and she is from United Kingdom ! Thanks to My british blogger friend : Kate Goldstone, for her kindness in sharing this post about the role of the copywriter in social media. Some business owners create all their content and marketing materials in-house. Others use a professional copywriter to create everything from blog posts to email marketing campaigns, printed direct marketing stuff to white papers and SEO-informed site pages. But what about social media marketing itself? Do you need to hire a pro to write Tweets for you, or write posts for Facebook? What is a copywriter’s role in social media? Commercial writers have specific skills, quite apart from being able to string messages and arguments together with the right amount of flair, fluency and creativity. A good writer will bring things like logic and a direct marketing perspective to the party. Plus the knowledge that benefits work harder to sell than bare facts, and the ability to come up with a consistent tone of voice and personality to reflect your business accurately. At the same time they know it isn’t all about overt selling. Successful social media marketing involves being engaging, interesting, fun, entertaining, relevant and appropriate, reacting to breaking news and trends, and above all doing people the courtesy of treating them like real human beings, not just prospects. What does your brand sound like? If your products are light hearted and casual, you don’t want to come across corporate and overly formal. If you run a funeral home you don’t want to appear disrespectful. You can never go far wrong if you stick to plain English and remember your audience is made up of human beings in all their glorious variety. That’s what copywriters do. A good copywriter will make sure your tone of voice and personality comes across clearly and authoritatively, with charm and verve, whether you’re a children’s entertainer or sell spare parts for oil rigs. The things they say on your behalf will blend seamlessly with the style of your site, blog posts and marketing materials, so you’ll come across as consistent… which in turn will help generate trust and improve your credibility. Yes, you’re harnessing social media to help you build brand equity, encourage inbound links and, with a bit of luck, make some directly-attributable sales. But you’re not there to irritate and bore people senseless by sending out an endless stream of sales-led messages, full of links and hash tags. You can do much better than that. A copywriter will identify subjects that are likely to fascinate, inspire, provoke, reassure, amuse or inform your audience, and share them in a way that directly reflects your business’s values, aims and culture. A writer with a direct marketing background will know exactly how to craft social media communications with direct response in mind. Whenever an action is required they’ll include calls to action. They’ll format communications so they flow logically. They will put the information in the right order, and use the right kind of words designed to drive people gently in desirable directions. So many Tweets and Facebook posts are dry and dull. A copywriter will have the confidence to build an appropriately attractive persona for your social media activities that helps your business stand head and shoulders above the crowd, attract re-Tweets and shares, inspire new fans and followers. Natural inbound links are like gold dust. Done right, social media marketing can attract inbound links to your site as people who love your content and communications share with their communities and your reach broadens. The more people see your content, the more likely that someone, somewhere will link back to it. Copywriters bear all this in mind. The moral imperative – Is it dishonest to use a writer to ‘be’ you? Ideally everyone on our beautiful blue planet would be able to write commercial copy with flair and je ne sais quoi. Sadly, they can’t. If you’re rubbish at writing or can write beautifully but don’t have a clue about the intricacies of marketing, it’s a natural step to hire a copywriter to promote your brand, products, services and culture to the world at large. I would draw the line at individuals. I wouldn’t feel at all comfortable pretending to be someone else, for example an actor, politician or author, where their opinions, experience, emotions and so on inevitably come into the equation. I think if someone is in the public eye, a celebrity or well-known for any other reason, their fan base deserves the real deal. My speciality is writing the content that social media links to – blog posts, landing pages, guides, white papers and so on – rather than social media marketing itself. I don’t write Twitter or Facebook posts for businesses, either. But there are plenty of writers who do. If you find someone who can handle everything I’ve talked about in this post, they’ll fit the bill. And then I thought it was important to write this short post with some points of chapter 1: The Extra Hour. Very important points to consider ( on my own opinion ) in our day to day! Skip the snooze button and train yourself to get up right away in the morning. If your business, book or blog is important to you, this will be incentive enough to wake up. Prepare everything you need for the morning ahead of time. A little less TV never hurt anybody. You can save aprox five minutes per day if you opt for a cold & healthy breakfast with items such as fruit, cereal & proteins bars. Keep your phone, tablet and laptop off as long as possible throughout your day. If you can keep the phone off or in your pocket when you’re walking instead of scrolling through who knows what, you’re likely to walk faster & keep your mind clear. Delegate a chore for favor, allowance or love. Answer your email only in the morning or everning. Go to bed five minutes earlier every day and get delivery for one meal a week. You get to treat yourself for all the hard work you’ve done. Not too late to start or keep doing 🙂 !! Are You Social Media Connector ? I am writing this post because there is something that caught my attention , one day, a very important Social Media leader here in the US told me that I am a great connector. All of us, in one way or other, have more developed skills than others, which is a normal in all human beings. I want to make it clear that these points are according to my own personal and professional experience. Recognize that you have that skill. Notice the leadership skills that these professionals have in the different social media platforms. Empathize with the professionals we want to connect. Distinguish the added value that can be given in the near future when connecting to these professionals. Analyze some skills in common such as specialty, language, topics, fields, ideas, good manners, vocabulary, etc. Look at different patterns of behavior online (yes, we can identify patterns of online behavior). See the different patterns of behavior offline (if we know people in person, of course it will help much more). Analyze his or her network and how it interacts with them and with you. Identify if these professionals are likely to help and share with each other. I hope that you find these 10 tips useful, and most importantly, apply them in real life if you think that you are a good connector or maybe to improve your skills.